Local insurance agency hopes to provide financial relief to a family as their daughter, toddler Kylie Adams, battles a brain tumor. As a family-oriented agency, we encourage the connection amongst local families, especially when it comes to fighting for the health of children in our community. 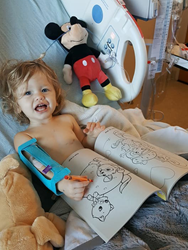 Carrie Mattox, Agency Principal of Forest Hill Insurance Agency, announced the beginning of their campaign to bring hope and relief to the Adams family, as their toddler, Kylie, is put through treatment to overcome a brain tumor. “As a family-oriented agency, we encourage the connection amongst local families, especially when it comes to fighting for the health of children in our community,” says Mattox. Anyone can join in the efforts by recommending friends, family and co-workers to the agency. They will make a monetary donation to the family every time one of them gets a quote – no purchase is ever necessary. Forest Hill Insurance Agency is known to consistently provide outstanding service to their community. Its knowledgeable team looks forward to helping local families protect the things that are most important to them. They can also help customers with a strategy for achieving their financial goals. To contact an expert at the agency, visit http://foresthillagency.com/ or call (434) 384-6700.